June 8, 2017 - These pharaoh cuttlefish change their appearance and behavior to mimic hermit crabs. But why? Researchers from the University of the Ryukyus, Japan, observed this unusual behavior while feeding the cephalopods in the lab. The cuttlefish would bend their arms and move them sharply like they were legs, and also develop dark spots on their skin. The researchers are not certain why the cuttlefish pretend to be hermit crabs but suggest it could be a form of defense useful in hunting small fish. Cuttlefish and other cephalopods are known to use camouflage and mimicry in the wild. The researchers hope to study the cuttlefish further to confirm whether the pharaoh cuttlefish are indeed imitating hermit crabs. 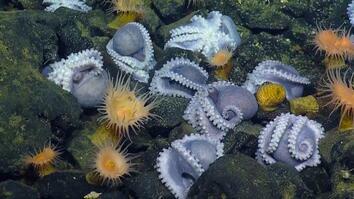 Read "Cuttlefish Pretend to be Crabs to Catch More Fish." What you are seeing is not a hermit crab. It’s a pharaoh cuttlefish pretending to be a hermit crab. Researchers from the Univ. 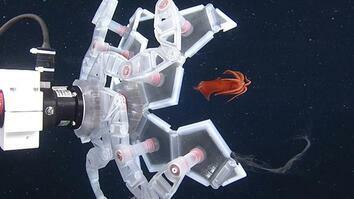 of the Ryukyus, Japan, observed this unusual behavior while feeding the cephalopods in the lab. The cuttlefish would bend their arms and move them sharply like they were legs. Dark spots would also appear on their skin. This behavior was displayed in two different situations: when the cuttlefish were introduced to a large space and when hunting small fish. 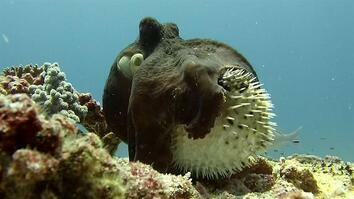 The researchers suggest several possibilities on why the cuttlefish imitate hermit crabs. Perhaps it’s a way to deter predators by looking like a hard-shell crustacean. Or it’s a way to lure prey by looking harmless, since hermit crabs do not hunt fish. Cuttlefish and other cephalopods are known to use camouflage and mimicry in the wild. The researchers hope to study the cuttlefish further to confirm whether the pharaoh cuttlefish are indeed imitating hermit crabs and why.